A fairly new breed, the Japanese Spitz was developed in Japan in the early 1900s. Their ancestry is debated, due to their similarities with several other breeds. One favored theory is that it is a miniaturized version of the Samoyed, but there is no documented link between the two. It seems more likely that it, like so many others, descended from the German Spitz. There are reports of both white German Spitz and American Eskimo Dogs arriving in Japan during this time. The American Eskimo itself came from the German Spitz, so it matters little which of the two were or were not used for its development. 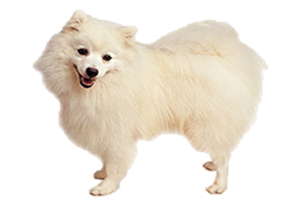 Even today white German Spitz, the American Eskimo, and the Japanese Spitz are almost identical to each other. They are so comparable that the American Kennel Club refuses to recognize the Japanese Spitz. In contrast, the Fédération Cynologique Internationale will only register the American Eskimo as a German Spitz. Unfortunately, this breed continues to lose ground in its homeland to the Shiba Inu, but it is finding fanciers in both the United Kingdom and Australia. Is the Japanese Spitz Right for You?